With great weather, great food, beautiful buildings, three of the best art museums in the world, amazing nightlife and what have to be some of the friendliest, most welcoming city-dwellers in Europe, Madrid is the ideal city for a fun-filled weekend away. Kick off your whirlwind romance with the Spanish capital by enjoying a few pre-dinner canas (that’s tiny glasses of beer to you and me) in the historic barrio de Las Letras, Madrid’s famed literary neighbourhood. Once home to everyone from Cervantes and Lope de Vega to Ernest Hemingway, Las Letras is literally overflowing with tiny tabernas, traveller-friendly bars and funky restaurants crammed with the raucous after-work crowd. Dive straight in and start at the buzzing Santa Ana and then work your way down Calle de Las Huertas, enjoying some classic Spanish tapas as you go. Start your day with a Spanish breakfast classic – tostada con tomate y café con leche, a simple yet surprisingly satisfying morning meal of toasted bread drenched in tomatoes and olive oil, and a strong espresso topped up with full cream milk. 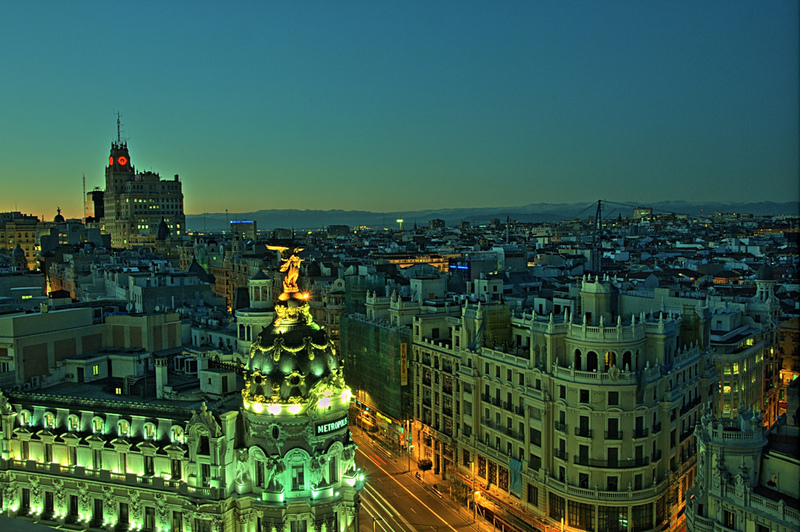 Madrid is justly famous for its “Big Three” art museums – the modernist Reina Sofia, the privately owned collections in the Thyssen-Bornemisza and the mighty Prado. All three are located on different stretches of the wide Castellana avenue and within easy walking distance of each other. Three museums is a bit much for even the biggest of art buffs, so it’s probably a safer bet to pick one or two, and give them the attention they deserve! Once your all museumed out, get yourself up to the gay-friendly district of Chueca, home to some of the best budget restaurants in the city, offering everything from classical Spanish fare to Asian fusion, all at a very reasonable price. Then it’s time to shop ‘til you drop. Start in the heart of the capital, at the postcard perfect Plaza Mayor square and move slowly north up the pedestrianized streets until you hit the Gran Via, an art deco gem that’s home to a number of international brands and designers. If quirky, boutique or vintage is more your thing, then take a sharp left up calle Fuencarral and into the neighbourhood of Malasana, one of the best shopping areas in the city. Stick around Malasana until the sun goes down – this uber-cool area is popular with students, fashionistas and travellers alike, and offers visitors a taste of where (and how!) the locals like to party. You can usually measure the success of your night by the strength of your hangover, and if last night was a memorable one then chances are you’re going to need some food in your belly to get you ready to face the day. The Madrid classic Chocolateria San Gines on calle Arenal is exactly what you’re after – strong coffee and plates piled high with doughnut-like churros, which are then dipped in a delicious dark melted chocolate that probably contains more calories than you would normally eat in a week. Sunday’s in Madrid are about one thing and one thing only – La Latina. One of the oldest and most vibrant barrios in the capital, La Latina plays host to El Rastro, Europe’s largest flea market. Join the scrum and elbow your way through the crowds as you bargain for everything from Spanish leather, antiques and bric-a-brac, and hippy jewellery straight from India. It can get pretty busy and is a haven for pickpockets, so keep an eye on your stuff!When the market closes at 2pm, do as the locals do and go for lunch. A big sit down meal in one of the neighbourhood’s classic restaurants like Daniela’s or Casa Lucio is great if you can get a table, but if not, then you will be spoilt for choice with the hundreds of tapas joints looking for your custom. Calles Cava Baja and Cava Alta are home to some of the best. If you’re still standing and your wallet is still not completely empty, then round off your weekend with some jazz. The fantastic Café Central, found just off the Plaza Santa Ana plays host to home-grown and international jazz talent, and offers one of the most authentic and atmospheric jazz experiences in town.